Temporary Intervention in Public Space. Research and concept design, Phase 01. Plovdiv 2019. The following proposal is part of the Open Call for Project Proposals for ‘Temporary Interventions in Public Spaces’ as part of the official positioning and presentation of Plovdiv – European Capital of Culture 2019. The suggestions include installation and identification of urban environment in public spaces and it is directly related to the presentation of Plovdiv as the European Capital of Culture. Our proposal was the highest rated by the jury of the open call. With our proposal, we take a look at the story of an ancient aqueduct coming from (possibly) Bunardzhik hill and connecting it to the fortified village of Nebet Tepe. We interpret the idea of ​​a “modern aqueduct,” which follows the topography of the terrain in this situation, and “expose” a part of such a facility. A structure that is created literally (and metaphorically as well) to connect, a metaphor that we could integrate into our solution. 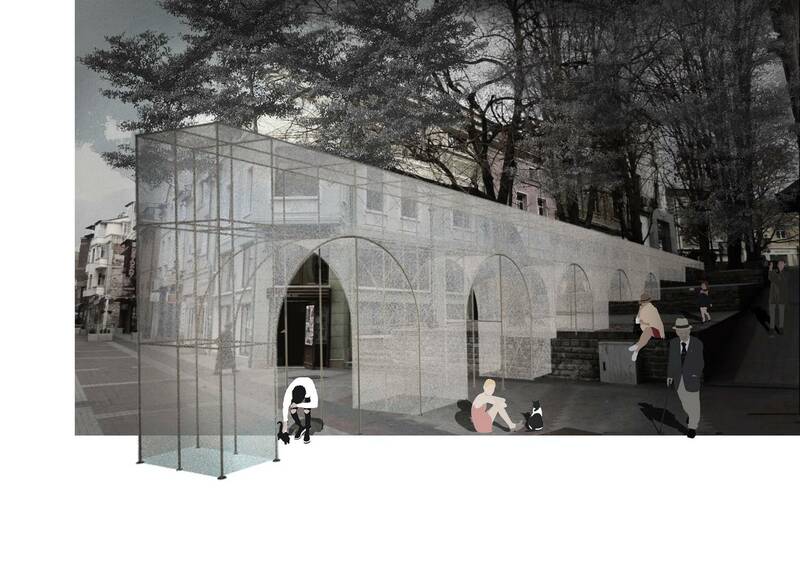 Our project propose an ‘aquaduct‘ looking temporary structure on a place with extremely richness of historical layers and history. After the archaeological research this place is to believe part of the real aquaduct path during the Roman period of the city. We use a part of this ancient structure ‘dividing‘ the city by the south-north axe but at the same time creating an ‘entrance‘ for the guest of the city in the axe east-west as is the real geographical location of the city of Plovdiv – a meeting place between different people, cultures, traditions, etc. during the past and until today. 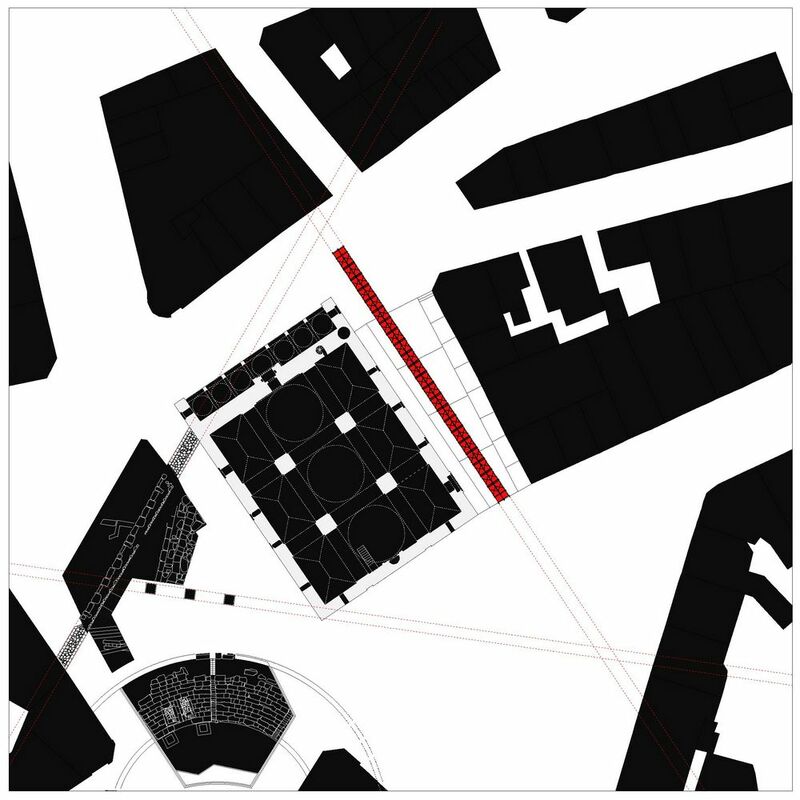 Site plan, Historic city center. The concept offers us a temporary structure, which in essence uses a construction scaffold, wrapped in a net, which is used again for construction purposes. 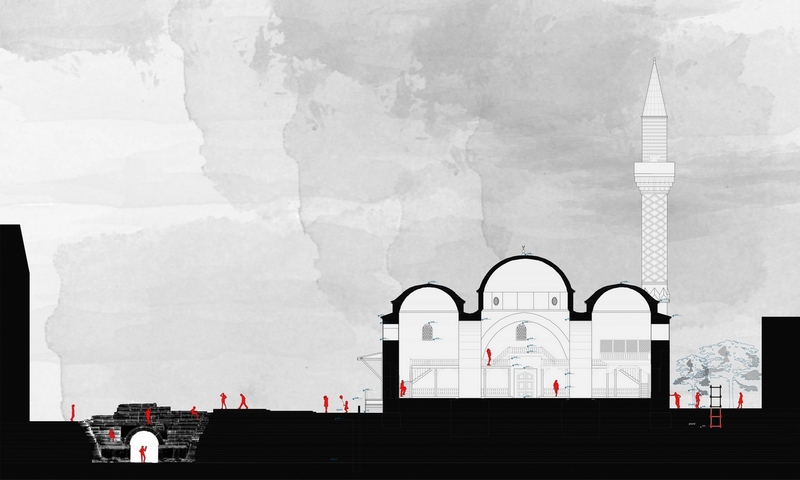 The idea is to reinforce the effect of a ‘temporary’ solution for a place in the process of being formed. Also, the proposed materials suggest easy and inexpensive maintenance, installation and would contrast with the rich historical environment around them without trying to resemble it and become a fakeness/stage props. The design solution provides for easy installation and disassembly, a lightweight and openwork construction and temporary interference that will appear – leave a virtual footprint – disappear without leaving a lasting physical footprint, such as its concept. It is envisaged that the placement and removal will occur in the spring-autumn months, which are suitable for the full use of the open spaces in the city of Plovdiv. Cross section, Historic city center. Drawing on the new visual identity, we fully agree with the significance of the arch as a strong symbol of the city that can be traced through perhaps all of its historical stages of development. We believe that this is an element that can successfully become purely physical in a “business card” of the city and find the situation just under the seat of the Plovdiv Foundation 2019 as the most suitable for a future (temporary) symbol of the city. We are trying to create not a huge (but still longer standing) installation; to create not a small boutique disconnected object, but a middle-scale installation that is organically linked and ‘grows’ from the ground of the site. We believe that once the installation is on the site, when all the existing trees are already green, it will be an interesting and memorable accent in the city’s newest fabric that contrasts but in no way tries to “overshadow” or mimic the rest historical layers. Site/Floor plan of the intervention. The main, highest part of the installation is located on the new square under the cascade and is metaphorically, the gate ‘to the city, to the new European Capital of Culture. We allow the eventual illumination of the installation or the placement of previously commented elements, saying that this is part of Plovdiv 2019 – a logo, inscription or other, to enhance the effect of a visual symbol. It is possible that the light installation is metaphorically compatible with the traditions of Italy, where the other capital of culture is located in 2019. The concept for the structure is based on the memory of the current chosen situation. The cascade behind Dzhumaya mosque is one of the places we could define as emblematic of the identity of the modern city. 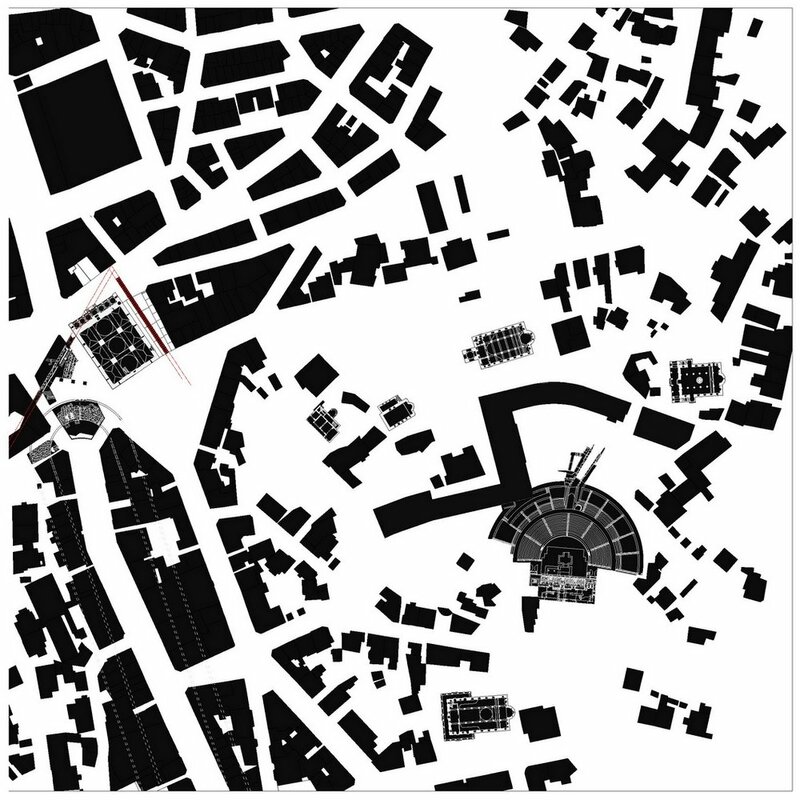 If we look at Plovdiv as a palimpsest, it is this place that gives us a glimpse of a number of stacked and intertwined historical and archaeological layers, part of the modern urban fabric of the city. The situation is an important place where we find together layers from the ancient, Roman, Ottoman, post-liberation, socialist and modern cities. Just a few meters from this place, find the foundations of the truly authentic antiqued aqueduct. The temporary installation is positioned on the north-south (cardo) axe, parallel to the wall of the nearby mosque without being in direct contact with it but forming a peculiar corridor closed from the west with the historic Ottoman architecture and eastward with the new (con)temporary structure. The modern aqueduct (or part of it) divides the existing terraced space into two distinct parts but also connects it because the installation itself is made up of a series of arches and open spaces that direct a future in-and-under movement around it. The installation lies between two valuable layers of the city, contributing to all new interactions between them – a temporary decor that overturns the relationship between them without disturbing it completely and permanently. Isometric view of the intervention. The installation itself is not aimed at direct physical contact with the audience, even though we can use it as a place for temporary exhibitions or exhibiting larger archeological or ethnographic exhibits in it – a kind of cabinet of curiosities. The interaction with the audience is accomplished by passing under the installation itself – a metaphorical gate which is located east-west (and from west to east), as is the city of Plovdiv itself – a bridge between cultures and civilizations, one a truly important position and role in the history. 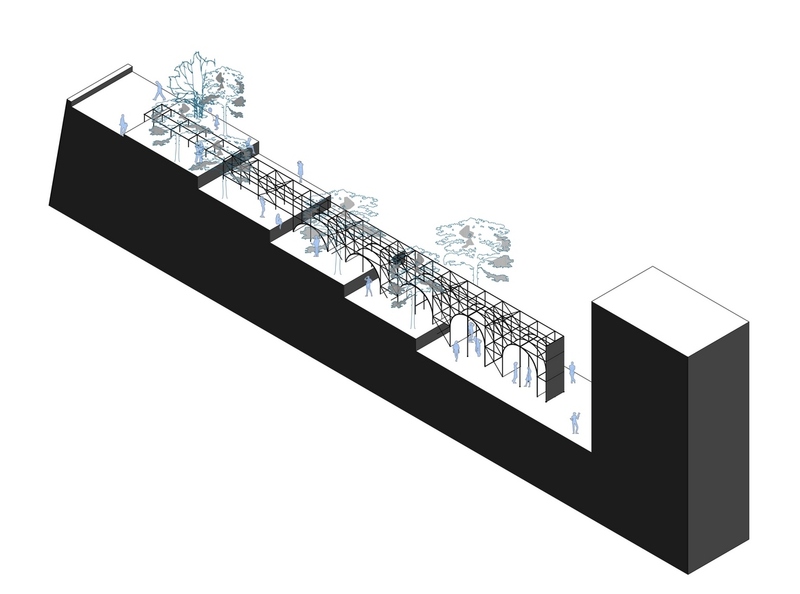 The installation resembles a wall that is, however, open and, instead of separating, it connects, omitting future visitors and city residents through it. We believe that such a “gate-arch” could become a strong visual symbol of the city in the months when it will be the European Capital of Culture and a visual element that can serve as an advertisement of the city of Plovdiv in a highly digitized world.